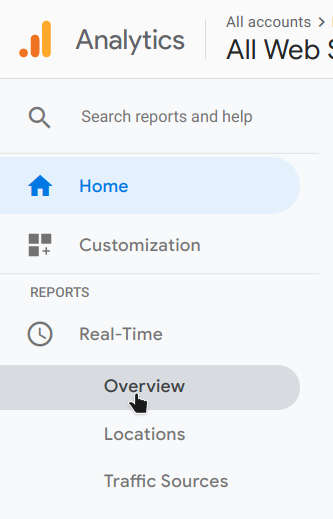 When Google Analytics collects data from your website (or app), it does not appear immediately in your standard report. First, it's formatted, aggregated and only then stored for you to view. This process takes time so to solve this google introduced Real-Time data reports. 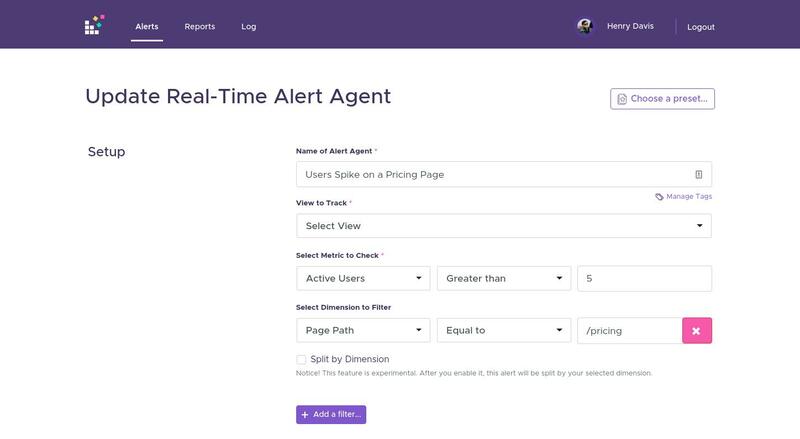 Real-time alerts are updated upon each page view (or hit) seconds after it occurs. This allows you to check how many people are on your website at any given moment and which pages are performing the best. 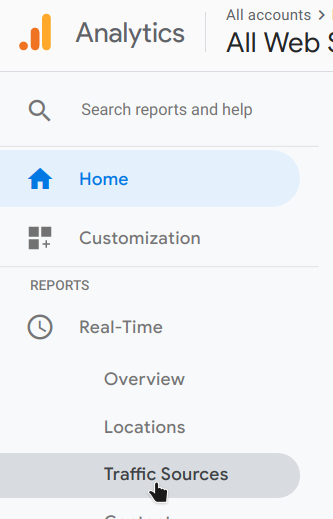 To see real-time data visit your Google Analytics view open "Reports", click "Real-Time" and "Overview". Real-time data shows your current website visitors, what they're looking at now and from where they came. Does Google Analytics support real-time alerts? Although real-time data in Google Analytics exists for a long time, GA doesn't support real-time alerts by itself. There is only API access Google opened but using it requires a lot of coding and different specific knowledge. On top of that, you have to perform a request to ask joining their limited beta. Using StatsGlitch for real-time alerts allows you to save your time and focus on your business, but if you feel adventurous, you can try Google API on the Google Developers Center. 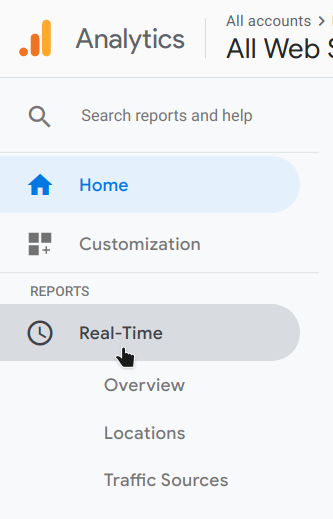 Currently (as of 2019 January) Google Analytics do not support real-time alerts. Consider this if you're using Goals in Google Analytics for your conversion events like user sign up or product sale. You can track them in real-time and be informed just a few minutes after they happen. Then you can craft a custom thank you / follow-up email to your customer or otherwise just enjoy the achievement of Goal. Pro tip: if you're achieving Goals frequently then setup a threshold and celebrate only conversion spikes like having 10+ sales over the last 5 minutes. If you don't have time or resources for Goals setup, there is a way to track specific success pages. You can setup a real-time alert that's triggered on product sale confirmation or signup confirmation pages. Keep in mind that you won't get so much value like having a dedicated Google Analytics Goal, but it will work the same way from alert perspective. User buys/signs up / perform any other conversion, and he navigates to a success page. Immediately after visiting that page StatsGlitch will send an alert to you so you could follow-up or just celebrate. Pro tip: you can track error/cancellation pages too. This way you can immediately follow-up with the person who's just canceled a subscription on your page or received an error while trying to pay via a credit card. Sometimes you can get unexpected links/shares from social media or other popular websites. This event can lead into some valuable traffic flowing into your page/business without you even realizing it. By setting up StatsGlitch real-time alert, you can be sure that you won't miss that traffic spike and will be able to use it at your advantage. If traffic is coming from social media be sure to follow-up it there and answer/ask any questions to boost it's potential and keep the post alive. Re-sharing or otherwise promoting via your account would be a good idea too. If traffic source is not from social media, look for any comments section to interact with the audience. If there are no comments be sure to share the source via your social media channels as it's gaining some traction. Pro tip: do not forget that more significant traffic can sometimes affect your website/services and prepare to fix things quickly. On the positive note, it can generate some serious amount of conversions/sales for you especially if you'll keep things rolling. Utm variables will help you to find out which users are converting in your project. More information about campaign parameters (utm codes) you'll find on Google Analytics Help Center. After setting up a proper email campaign, you can track in the real-time when users are starting to click the links in your email. How to get started with real-time alerts.